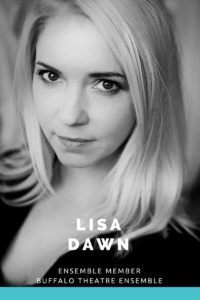 Lisa Dawn is a company member at Buffalo Theatre Ensemble where she was recently seen as Lucy in the Chicago Premiere of “The Dingdong” and Sarah Goodwin in the critically acclaimed “Time Stands Still”. She has been acting/directing for Chicagoland community and professional theatres for over two decades, and also traveled to Los Angeles to portray the role of Jess in an adaptation of Nick Hornby’s novel “A Long Way Down”. She is also an actress/instructor for Illinois Police Department’s Crisis Intervention Training, where the focus is to create improv role play scenarios that educate officers to advocate for the mentally ill in our community. She is no stranger to the Wheaton Drama stage, you may have seen her in Full Circle, The 39 Steps, Rabbit Hole, and The Elephant Man. She directed WDI’s 2014 production of Steel Magnolias and is thrilled to be directing WDI’s Wit in winter 2019. LD is also a photographer (emergence-see.com), Reiki Master, Yoga Instructor, Bartender, Hip Hop Artist, and self-proclaimed wizard.